SALEM—McNary math teacher Louis Tiller’s dad died when he was 9 years old, leaving his mom to raise six kids. One of Tiller’s own sons had craniofacial surgery when he was 8 months old. Another was diagnosed with dyslexia. Tiller failed his first Calculus class in college and when he interviewed for a math position at McNary, the first time, Tiller didn’t get the job. Tiller said he expects the Class of 2018 to overcome disappointment and to continue when things are difficult. 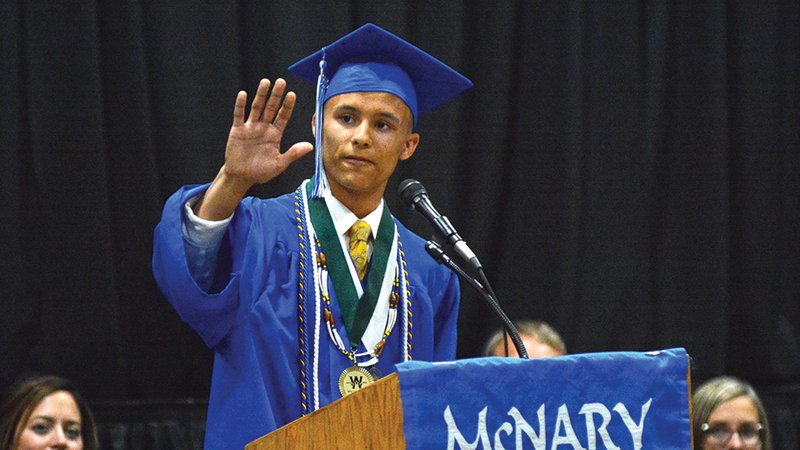 Samuel Hernandez Jr., McNary’s student speaker, left the graduating class with a lesson he learned running cross country. On Saturday, June 2, the serenity of a beautiful morning overlooking the Willamette River in Keizer was ruined by semi-automatic gunfire from across the river in Polk County. Approximately 500 rounds were fired that morning, mostly by semi-automatic weapons; my neighbor’s home was hit by a stray bullet. The bullet traveled through the exterior and interior wall of their home narrowly missing my neighbor’s wife as she stood in her kitchen. This reckless incident occurred less than a year after a similar incident at Sunset Park in Keizer, again the result of semi-automatic gunfire from across the river in Polk County from the same property. I am sick of the near constant shooting from this property, as are every single neighbor that I have talked to. I hate living in fear when the shooting starts. Now we know without a shadow of a doubt that we are not even safe in our own homes. This is no way to go through life, fearful, wondering if this is the day something terrible will happen. My wife and I just celebrated our 30th year of living in our home in Keizer on the Willamette River. We have seen more than our share of tragedy while living here. There was the incident in the early 1990s while waterskiing on the river we were buzzed by a float plane. The pilot flew very low over us, with the sun in his eyes, we feared he did not see us and would collide with our boat as he landed. We filed a complaint with the FAA in Seattle but sadly they blew-off our complaint. That pilot continued his reckless behavior and it was soon after he struck and killed two people in a canoe near Wheatland Ferry, leaving two young children without parents. Then there was the horrible collision between two Jet Ski’s playing “chicken” that left a young mother dead in my boat, in front of my young children. That tragic accident also left two young children without a mother. Reckless behavior will probably always be with us, but reckless behavior with guns capable of firing bullets 1-2 miles is completely unacceptable near residential homes and parks in Keizer. How pathetic is it that the reckless discharge of semi-automatic weapons is occurring on property owned by a Salem firefighter whose professional mission is public safety? It is almost unbelievable, except that it has been happening for years in spite of many, many complaints. Hundreds of rounds—perhaps thousands of rounds—fired several days per week, almost year round, suggest that this property owner is not very interested in the safety and well-being of the citizens of Keizer. This has to stop now. Since the development of Keizer Rapids Park the Willamette River has become a busy place. Summer days can see hundreds of rafters, kayakers and power boaters. These people deserve an environment free of reckless gunfire in which to recreate. I am a gun owner and lifelong hunter, and I firmly believe in the responsible and legal use of firearms. but I don’t believe in fools using guns recklessly in an urban area. I am calling for a ban on the discharge of handguns and rifles on this property. It’s only a matter of time until a tragedy occurs. As I described earlier I have seen enough tragedy from actions that could have been prevented. Please contact Keizer city councilors, and especially commissioners from both Marion and Polk Counties. We have to do something now. Bullets continue to fly across the Willamette River, this time on June 2 into a home on the river and barely missing the resident. This, after an incident last Sept. 10 when a hail of bullets sent park-goers running for their lives from Sunset Park and just recently I learned of another occurrence about two years ago in the same neighborhood. After the Sunset Park incident the West Keizer Neighborhood Association (WKNA) took our concerns to the city. The WKNA Board and numerous neighbors appeared before the mayor, city council and city staff several times, asking that something be done. Letters were written to the mayor, councilors and staff including the Keizer Police Department and the Marion and Polk County Commissioners alerting them to this public safety issue. We learned that the bullets were coming from a shooting range in a rock quarry across the river. A sign was posted at the quarry alerting shooters that there were residential homes across the river. Obviously this is not enough! I am asking our city officials including the police department to do something….Isn’t that your job? To protect your citizens? This is a serious public safety issue—three incidents in four years! Do not shrug your shoulders and claim it is out of your jurisdiction. We deserve better. I read the June 8 letter to the editor (#Justice for Shadow) written by Lori Beyeler. She let her cat outside and a neighbor trapped it and released it miles away. It is wonderful that she did find her cat. I feel the person who trapped the cat should be charged with malicious mischief and theft. I adore cats and feel they deserve care, affection, and safety. A large part of providing safety for one’s cat is to keep it indoors. Cats do not need to be outside. People let their pet cats outside because they don’t want to be bothered with a litter box and because they have the misinformation that cats can’t be happy unless they are outside. A cat cannot be safe outside. There are numerous dangers to them. Also, outdoor cats killed approximately 2.5 billion birds each year in the continental United States. We can’t afford to keep losing birds. Please keep pet cats indoors. BERLIN—It is strange being in a foreign country and watching American post-World War II leadership—as practiced by presidents such as Harry Truman, Dwight Eisenhower and Ronald Reagan—collapse into a heap of chaos, ignorance and self-indulgence. Donald Trump’s performance at the G-7 in Quebec—his personal attacks on other leaders, his tariff threats against close allies, his rejection of the joint communique via Twitter—will strike most Americans as just another day at the office for the great disrupter. For Europeans, it was a demonstration that the seedy, derelict carnival of Trumpism is not just a show put on for Trump’s political base. Or more accurately: Everything Trump does is a seedy, derelict carnival put on for his political base. To be an American in Germany these days is to be besieged by earnest, anxious questions about the intentions of America’s president. Germany is a country—because of a unique and horrible history—that provides leadership by standing for a rules-based global order. Since power proved so dangerous, it must be replaced by process. This worldview is especially threatened by Trump’s comfort with chaos and rule by impulse. During the first year of the Trump administration, it was possible to assure concerned foreigners that the president was being constrained by responsible advisers. He did not dissolve NATO, or abandon NAFTA, or bug out of Afghanistan. But now we are seeing Trump unbound: a president increasingly confident in his own damaged instincts, untethered from reality and surrounded by advisers chosen to amplify his insanity. So, if encouragement is no longer possible, what about a little schadenfreude? I lived through a period in the 2000s in which Europeans (and Canadians) often complained about American exceptionalism. It was dismissed as arrogant, messianic and annoying. And, no doubt, Americans can be a bit much to take. But is post-exceptionalism America really more desirable? The Trump administration has moved toward a more Putin-like foreign policy: oriented toward narrow economic and security interests, dismissive of human rights and humanitarian concerns and tilted toward the cultivation of favorable despots. And this shift has been matched by a changing national self-conception. With a president systematically attempting to undermine sources of authority that check his power, our nation is becoming normal in other disturbing ways. We had thought that democratic digression only happens in other places. One effect of this shift away from idealism and universalism is the loss of certain universal ideals that helped bind the Atlantic alliance. The Atlantic Charter, authored by FDR and Winston Churchill, was not just a statement of national war aims but of international commitments—to economic collaboration, self-government and a “wider and permanent system of general security.” These vows are what turned resistance to Soviet aggression from a necessity into a cause. With these commitments, western countries were a squabbling family. Without them, they are just squabbling neighbors, throwing garbage across the fence. This is perhaps the largest foreign policy crisis of our time: an American president who has lost the ability to distinguish friends from enemies. Our traditional friends are attacked as freeloaders and cheats. Our real enemies are praised and cultivated — in the case of Russia, allowed to undermine American elections with minimal consequence and sponsored by Trump for readmission to the G-7. Trump’s moral blindness has led to strategic turmoil. America has had weak leaders before. But since World War II, every president has mentally located his country in the free world, bound by democratic values, trade and common purpose. Trump is operating on a different map. He is actively hostile to the internationalism that defined the western alliance. And he is joined by rising ethno-nationalist forces within Europe itself. We don’t know how this chaos will eventually coalesce. But one thing is certain: The alternative to the free world will be less free. Sleep is important. We respect it and recognize its value in maintaining our health and well being. Serious sleep deprivations can result in illness, psychoses and death; however, such conditions can be minimalized in dynamic, pro-active, youth-connected high schools. 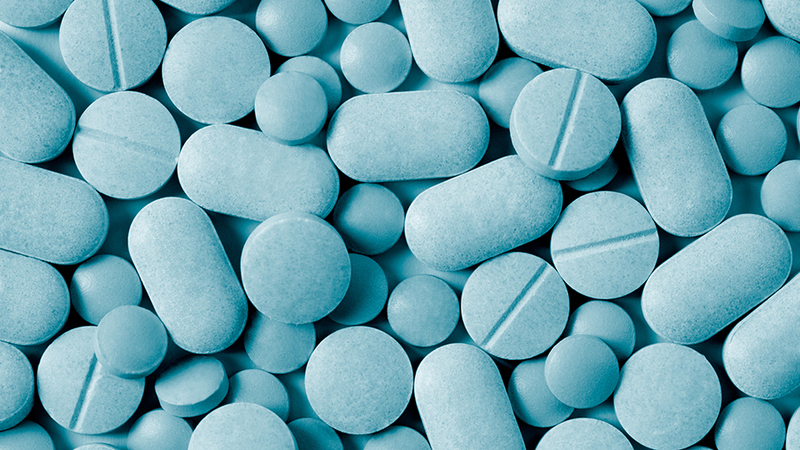 The Oregonian recently carried an article reporting that high school start times can cause youth of that age to contract depression, even die by suicide. Kyle Johnson, a psychiatrist at Oregon Health and Sciences University spoke at a forum on this public health issue, he and others believing that early starting times can wreak havoc with both academic and athletic performance and result in dire consequences. Starting times at all Portland high schools is 8:45 a.m.; in Beaverton, it’s 7:45 a.m. The public high schools in the Salem-Keizer district start classes at 7:30 a.m. with a late start on Thursdays at 8:05 a.m. The starting time subject was also addressed at the same forum where Johnson spoke by way of the Multnomah Youth Commission. The MYC views early starts as contributing to chronic absenteeism where lack of sleep leads to Oregon’s low school success and thereby poor graduation rates. Starting time plays a much smaller role than what some “experts” argue. In the first place, those students who are motivated by drama, music, athletic and any other extracurricular interests will arrive in school, or most anywhere deemed safe at whatever hour, as necessary to pursue their interest. My wife and I raised two daughters who were engrossed in music and sports throughout their high school years. Their interests required an early rise every school day yet they handled the early risings without complaint because they chose to participate. Depression and suicide may have a lot to do with the youth in our high schools being directly impacted by the way American high schools are generally organized and managed. Sure, there are electives and extracurricular choices. However, these are often unavailable or quite limited in staff and materials due to the amount of money or lack of same the state dedicates to public education. On the negative side of the high school ledger, and often playing a significant role in contributing to depression and suicide, is that too many students are controlled and circumscribed by inordinately heavy-handed teacher-authoritarians. Otherwise, for many youth what’s called a higher school is spending their waking hours in a collection of confined spaces that thwart the interaction, integration and exchange of ideas and because they’re required by law to attend. They receive an education typically delivered in lecture format with very little give-and-take by persons who are more like civilian drill sergeants than leaders of learning who inspire thought and reflection. Students soon take no interest because no real interest is taken in their racial, cultural, sexual and religious identity. One common condition often prevails with saddening frequency and that is that highly intelligent youth must hide their mental abilities. One can argue starting times until one is blue in the face, but until public schools are drastically reformed to be youth-serving and centered rather than authority-figure cen. Naow, under Secretary of Education Betsy DeVos, going more and more to private ownership and profit-making rather than devoted to providing the building blocks for successful lives, we’re stuck with more student depression and suicide. As the clock turns day after day, American culture and all human activity here continues to inexorably change but high schools remain inflexibly fixed in another time and place.